The spring has passed / and the summer come again / for the silk-white robes / so they say, are spread to dry / on the Mount of Heaven's perfume (春過ぎて 夏来にけらし 白妙の 衣干すてふ 天の香具山). 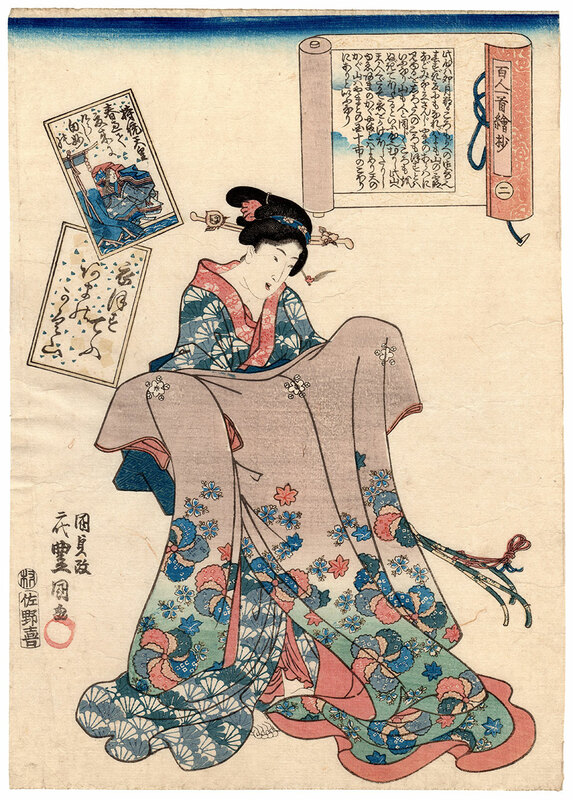 The verses we read in the upper left of this fine woodblock print were composed in the 7th century by the forty-first empress of Japan, Jito Tenno (持統天皇 ), and are taken from Hyakunin Isshu (百人一首), literally "one hundred people, one poem", the famous collection of waka (和歌) poems consisting of one hundred poems written by one hundred different poets. 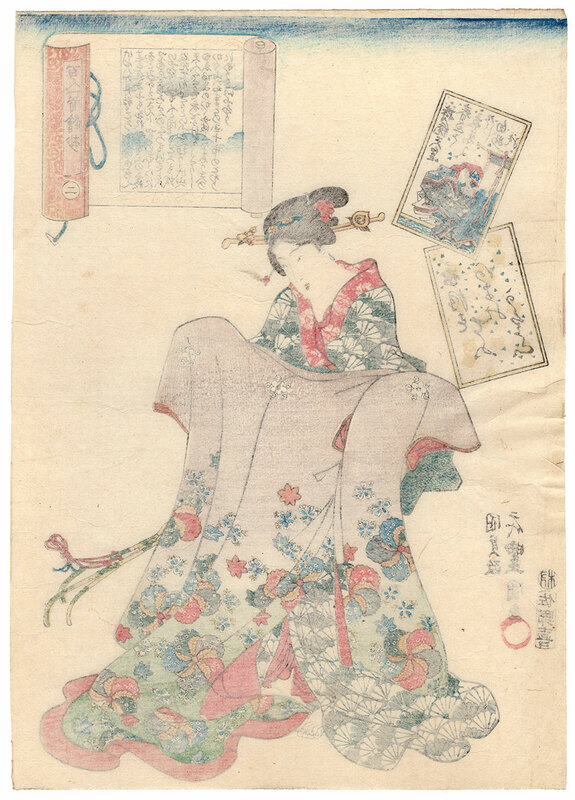 The work, printed around 1844 by the publisher Sanoya Kihei (佐野屋喜兵衛), owner of Kikakudo (喜鶴堂), is taken from the series "A Pictorial Commentary on One Hundred Poems by One Hundred Poets" (百人一首絵抄) by the artist Utagawa Kunisada (歌川国貞). The print on Japanese washi paper (和紙), despite a slight general discoloration, is in good condition. When you import goods from Japan, you are responsible with ensuring to comply with laws and regulations of the country you reside in. In this case, you may have to pay customs duties and taxes. Accordingly, if the Customs Administration of the country you reside in charges such costs to you upon delivery of the package, then you are responsible to pay them. 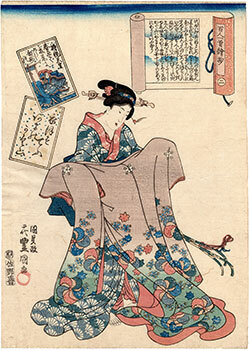 The relevant amounts and the time of delivery, which are not under control of and cannot be predicted by ArtJapanese.com, may vary according to type of goods. Should you have any doubt or need further information, we recommend you to contact the Customs Administration of the country you reside in.